or like some translucent sea creature perhaps, with galaxies in its veins and tendrils — the mind of Anders Breivik is imaged here by Britain’s Guardian datablog in a graphical mapping of the hyperlinks found in his 1500 page manifesto, and the links between the sites he links to. Beautiful, no? Like an early morning bouquet? 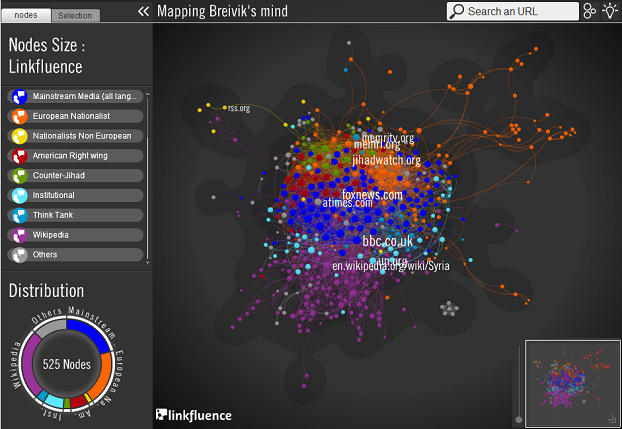 mapping Breivik’s online links for us is a valuable service. the glamour of high-tech graphical interfaces can be deceptive. there’s no map of the link between concept and act. That last one, if you ask me, is the real bouquet. We can know quite a bit about what Breivik read, and even figure out some of how he “connected the dots” – but the move from thinking about to taking action is the one that matters most – and we don’t have much of a handle on it. It’s not on the map. A lot of our maps and models move between one quantity and another, and a lot of our thinking, correspondingly, has to do with materiel rather than morale — but nowhere is there a map or model of how quantity and quality affect each other, or how morale “force multiplies” materiel — even though “real life” moves seamlessly between (subjective, qualitative) mind and (objective, quantifiable) brain. We have no map to walk us through the hard problem in consciousness — except our own insight. And x-rays do not an insight make. This entry was posted on Thursday, September 15th, 2011 at 6:12 pm	and is filed under analytic, blogosphere, Breivik, Charles Cameron, extremists, graphical thinking, hard problem in consciousness, Hipbone Analysis, ideas, insight, map, network theory, Patterns, Perception, philosophy, psychology, Uncategorized. You can follow any responses to this entry through the RSS 2.0 feed. Both comments and pings are currently closed. Good one, Charles. That’s been bothering me too. And this Guardian article reminded me of that. So the hyperlinks are there. But did he disagree with them? Did he use them as bad examples? Or, if he used them more positively, how did he weave them into his justification for action? And then, as you point out, what was going on in his brain that manifested itself in these ways? From a strategic theory perspective: who cares . . .
It’s too bad it doesn’t show time. Time in order of connections and time in amount of time spent at each link, unless that is what the distance is showing. This timespent would show some kind of magnitude to the events he spells out. I can see how the the data by itself could be considered totally worthless without context, as seyditz89 so elegantly states, but it does look pleasing. As our rule-sets begin with the environment we observe, and we orient ourselves as we move, first from one advantage to another, then it would help to identify that movement, with some understanding as to the magnitude of change. It would be a limited understanding, but more than what you have here, unless you are able to read patterns (the beauty of the movement), instead of distance from connections, in relation to time (magnitude). If you’re a policeman, maybe it’s interesting. Art? Sure, why not? But in terms of strategic theory, it’s like reading the stocknumber off a spent shellcasing, or the etchings and grooves of an old sword . . . Most of the links from Breivik’s manifesto are to sites whose views and positions he supports — but who may very well be disgusted at the actions he took. The question inevitably arises as to what constitutes (tolerable) free speech and what constitutes (intolerable) incitement. Human nature, what can I say? Your point about time is an excellent one. I imagine Norwegian police analysts must be piecing together something of a timeline from his computer, but whether they’re thinking purely in terms of actions — contacts, phone calls, visits — or following the development of his thinking is anyone’s guess. 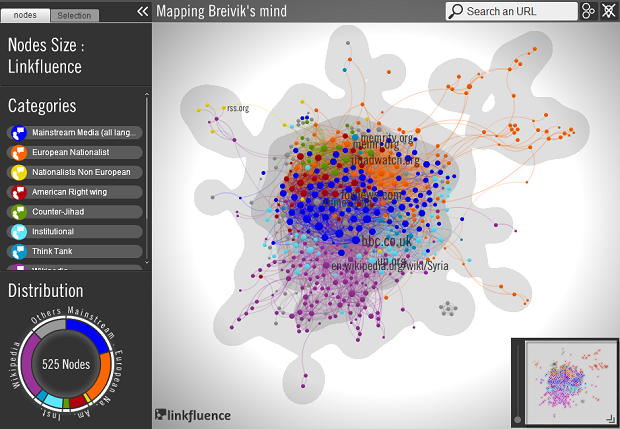 I think part of the point of the mapping is to show how closely interlinked the people and web places Breivik linked to are among themselves — largely a private discourse. But there’s not nearly enough clarity about what the diagrams are showing, and I suspect the designers were after a pleasing graphical effect for gee-whiz business / sales use, and that (eg) the whispy "tendrils" don’t particularly "signify". Edward Tufte might have a thing or two to say about that. Neuroscience vs philosophy: Taking aim at free will — Scientists think they can prove that free will is an illusion. Philosophers are urging them to think again. Your point is well-taken; a splattering of perhaps random connections is incomplete without an accompanying timeline. I sat in on a law class in Wills this morning. I looked over the shoulder of a student in front of me—he had hand-drawn a clever, but seemingly useful time map of the implications of a very complicated will. Time helps contextualize, and in this case would be invaluable for greater meaning in a meaningless act.